1. Firstly, remove any labels on your wine bottle, wash it out and leave to dry. 2. Cut your chosen First Edition Deco Mache paper into small pieces. 3. Apply some First Edition Deco Mache Gloss Adhesive with your First Edition brush set and begin adding your Deco Mache paper squares to the bottle, ensuring to layer on more glue as you go. Continue to do this until your bottle is completely covered. TIP: Use the hog hair brush in your First Edition brush set to create a smooth and professional finish. 4. Leave your bottle to dry. If you notice any areas that need more coverage, layer on more Deco Mache paper squares to the area. Add a final coat of First Edition Deco Mache Gloss Adhesive to achieve a nice, gloss finish on your bottle. 5. Cut a piece of Dovecraft A4 Kraft card down to the size of a tag, ensuring to cut the two top corners and to punch a hole to resemble the look of a tag. Stamp the words ‘New Home’ using the Simply Creative Alphabet Stamp – Typewriter set onto the bottom of your Kraft tag. Loop through a length of Dovecraft twine through the hole at the top of your tag. 6. Next, die cut various sizes within the First Edition Scalloped Circle die set onto approximately 8 pieces of First Edition Deco Mache paper. Scrunch the circles to create a shabby chic look, pierce a hole through the middle and secure the layered pieces with a Dovecraft Sweet Paris pearl brad. 7. Adhere your flower to the centre of your kraft tag with Dovecraft Perma Fix tape. Tie your tag to the neck of the bottle. It really is that simple! You could use different First Edition Deco Mache papers to achieve a different effect for a variety of occasions. 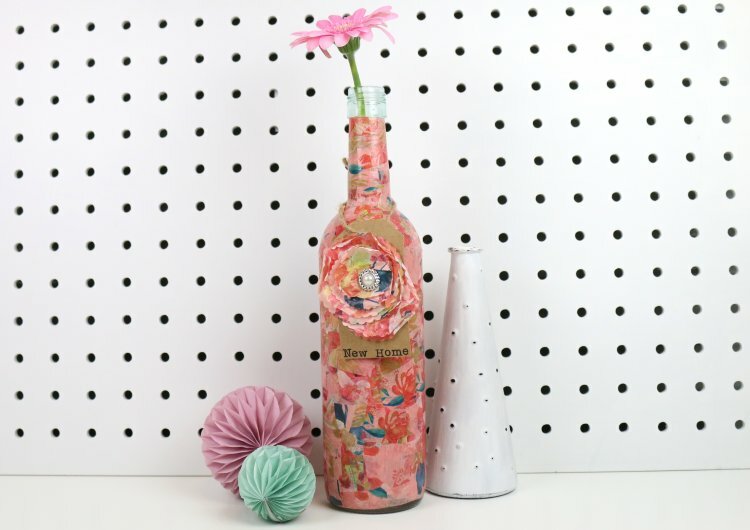 How will you upcycle your wine bottle? We would love to see your versions so remember to upload your upcycled makes to the project gallery and to #trimcraft on social media so we can have a nosey!